The purpose of this guide is to assist users of Explore Chicago Collections throughout the research process. As you click through the navigation menu on the left, the guide will provide tips for navigating the search portal, creating citations, visiting member institutions and expanding your research beyond the Explore Chicago Collections portal. It will also address rights and access issues and offer resources for educators. 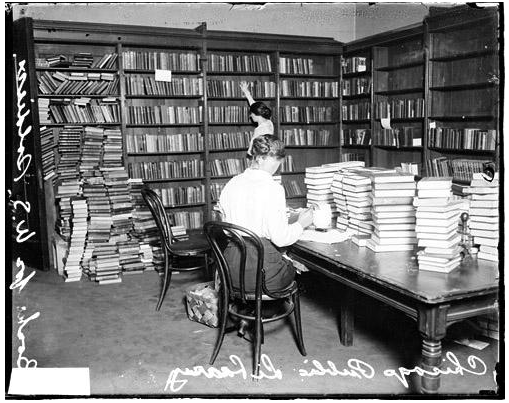 Women working in a room at the Chicago Public Library where they are collecting books for U.S. Soldiers. Photograph. Chicago History Museum, Chicago. <http://explore.chicagocollections.org/image/chicagohistory/71/f18ss2c/>.